The last 50 years have seen dramatic demographic, social and technological changes in this country, and different generations of Americans have their own distinct reactions to these changes. The racial and ethnic makeup of the country has been transformed. The 1950s-era nuclear family is now just one of a growing variety of family arrangements. And the old means of communicating have given way to digital platforms that were unimaginable 50 years ago. In general, older generations are having a harder time processing these changes, while younger generations are more likely to take them in stride. Among older adults, there is a tension between their belief that America is the greatest country in the world and a sense of pessimism about the country’s future. Younger adults are less convinced of America’s greatness but more comfortable with the path the country is currently on. Overall, nearly half (48%) say America is the greatest country in the world, and another 42% say it is one of the greatest countries in the world. Fewer than one-in-ten (8%) say the U.S. is not one of the greatest countries in the world. There are sharp differences across generations on this question. 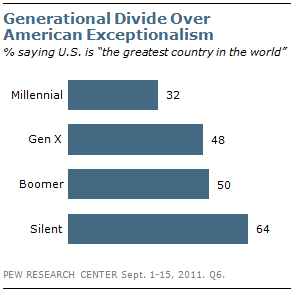 Millennials are the least likely to say the U.S. is the greatest country in the world – 32% hold this view. The share rises with each successive generation, with nearly two-thirds of Silents (64%) saying the U.S. stands above all other nations. This comes in spite of the Silents’ discomfort with many of the societal changes they have witnessed in the past 50 years. Within the Silent generation it is the oldest members who feel most strongly about America’s greatness – fully 72% of those ages 76 to 83 say the U.S. is the greatest country in the world. This gap is not new. 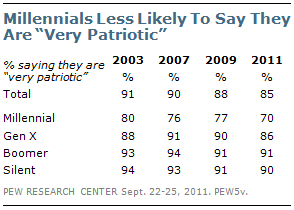 In surveys dating to 2003, Millennials have been less likely to say they are very patriotic than have older generations. Despite differences over American exceptionalism and feelings of patriotism, generations are largely in agreement about the factors that have contributed to America’s success. Overwhelming majorities – more than 90% across all generations – say “the freedoms we have” are very important in contributing to America’s success. “Our work ethic” is viewed as a very important factor in America’s success by more than 80% of respondents from each of the four generations. And “our natural resources” are viewed as very important by nearly as many (82% overall). Roughly three-quarters of all adults (77%) say “our military strength” is very important in contributing to America’s success. Here there are significant differences across generations. While at least eight-in-ten Boomers and Silents say this has been very important to America’s success, only about seven-in-ten Millennials and Gen Xers agree. Millennials are less likely than others to say “our democratic system of government” has been an important factor in America’s success. Only 62% of Millennials say this has been very important, compared with roughly three-quarters of those older than 30. For the most part, the generations are in agreement about the value of the free market economy in terms of America’s success. Overall 70% of adults say this has been very important – this includes 66% of Millennials, 71% of Gen Xers, 75% of Boomers, and 69% of Silents. 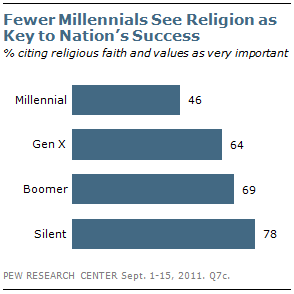 There is much less consensus over the importance of “our religious faith and values.” Fewer than half of Millennials (46%) say religious faith and values have been very important in America’s success. This compares with 64% of Xers, 69% of Boomers and 78% of Silents. The country’s racial and ethnic makeup is viewed as a somewhat less important factor in America’s success. Overall, 58% of the public says this is a very important factor, and there are no significant differences across generations. However, when respondents were separately asked about specific trends contributing to the increased racial and ethnic diversity of the country, wide generational gaps emerged. While older Americans are more likely than their younger counterparts to believe the U.S. is the greatest nation in the world, they are more ambivalent about the country’s current trajectory. In a January 2011 Pew Research Center survey, half of Silents (50%) said that life in the United States has gotten worse since the 1960s; 31% said life has gotten better while 17% said life in this country has stayed about the same. Boomers expressed similar views about how life has changed in the U.S.: 46% said it has gotten worse, 29% better, and 20% said it has stayed about the same. The balance of opinion is just the opposite among Millennials and Xers. 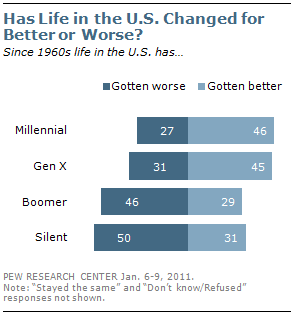 Some 46% of Millennials and 45% of Xers say life in the U.S. has gotten better in the past 50 years. Less than one-third of either group says life has gotten worse while roughly one-in-five said it has not changed. In the same January 2011 survey, a narrow majority (54%) of all adults said they were very or somewhat optimistic about the future of the U.S. over the next 50 years, while 42% felt very or somewhat pessimistic. Majorities across generations expressed optimism about the nation’s long-term future, with one important exception. Fewer than half (46%) of Boomers said they were optimistic, while 51% were pessimistic. In the current poll, respondents were asked whether America’s best days are ahead of us or behind us. Roughly half (51%) of the public says our best days are ahead of us, while 39% say our best days are behind us. Millennials and Gen Xers are somewhat more positive than Boomers and Silents about America’s prospects: 55% of both Millennials and Xers say our best days are ahead of us, and 37% from each group say our best days are behind us. Boomers and Silents are more divided; about half of Boomers (48%) and Silents (47%) say America’s best days are still to come. There is a substantial split among Gen Xers on this question, with younger Xers looking more like Millennials and older Xers looking more like Boomers. 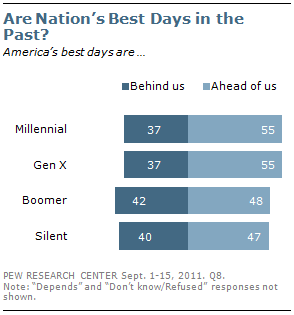 Among young Xers, ages 31-38, 61% say America’s best days are ahead of us; among those ages 39-46, only 49% agree. Underpinning these concerns about America’s future are views about specific societal trends which have transformed the country. Respondents were asked to evaluate a variety of changes that have taken place over the last 50 years in American society. The items ranged from the country’s racial and ethnic makeup to the invention of the internet. Millennials consistently express a more positive view of these changes than do older generations. There are several factors contributing to the nation’s changing racial and ethnic composition. The influx of immigrants has been a key factor, but so has the increase in interracial and interethnic marriage. One-in-seven new marriages in the U.S. in 2008 were between spouses of a different race or ethnicity from one another, according to an analysis of data from the Census Bureau’s American Community Survey (ACS) by the Pew Research Center’s Social & Demographic Trends project. Overall, the public has a fairly positive reaction to the trend toward inter-marriage. Some 43% of all adults say more people of different races marrying each other has been a change for the better. Only 11% say this has been a change for the worse, and 44% say it has not made much difference. On this measure and others relating to changing racial and ethnic patterns, there are significant differences of opinion across the generations. 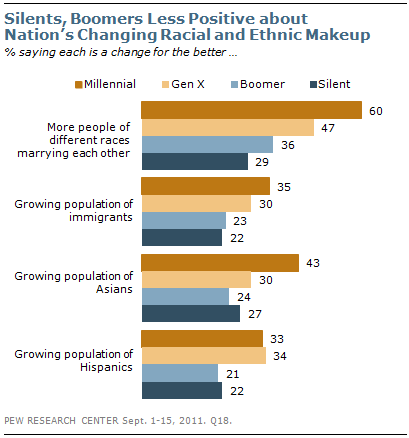 Millennials are extremely positive about the trend toward inter-marriage. Six-in-ten say this has been a change for the better. Gen Xers are more ambivalent about this change: 47% see it as a change for the better while 46% say it hasn’t made much difference. Boomers are less likely to see this as a change for the better (36%), though only 14% say it has been a change for the worse. Among Silents, 29% say this has been a change for the better, 16% say it’s been a change for the worse, and 49% say it has not made a difference. The public is less positive about the influx of new immigrants. Overall, 27% say the nation’s growing population of immigrants has been a change for the better, 37% say this has been a change for the worse, and 29% say it has not made much difference. Roughly one third of Millennials and Gen Xers see the rising share of immigrants as a positive change. Only about one-in-five Boomers and Silents agree. Among the older generations, roughly four-in-ten say the growing population of immigrants has been a change for the worse. These differences are due in part to the racial and ethnic composition of the generations. Fewer than six-in-ten (59%) Millennials are non-Hispanic whites. This compares with about 79% of Silents. As a result, after controlling for race and ethnicity, the generational differences are more muted. Among non-Hispanic white Millennials, 28% say the growing population of immigrants has been a change for the better; this is not significantly different from the 21% of non-Hispanic white Silents who say the same. The two largest groups immigrating to the U.S. over the past 50 years have been Asians and Hispanics. Overall, 30% say the growing population of Asians has been a change for the better; about the same percentage (28%) views the growing Hispanic population positively. However, more people say the growing share of Hispanics has been a change for the worse (22%) than say that about the growing share of Asians (12%). Millennials are more positive than any other generational group about the growing population of Asians – 43% say this has been a change for the better, compared with 30% of Gen Xers, 24% of Boomers and 27% of Silents. With regard to Hispanic immigrants, roughly one-third of Millennials and Xers say this group’s growing population has been a change for the better. Among Boomers and Silents, smaller numbers (21% and 22% respectively) say this. The generations are also divided over several major social changes that have occurred over the past 50 years. Women have assumed a more prominent role in the labor force, marriage rates have fallen sharply, and the definition of what constitutes a family has broadened considerably. In general, Millennials embrace these changes to a much greater extent than do their older counterparts. Silents, who have witnessed the greatest amount of change over their lifetime, are having the hardest time adjusting to these changes. 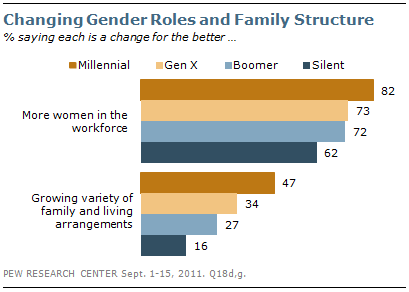 Most adults agree that the trend toward more women in the workforce has been a change for the better. Millennials are the most enthusiastic about this change – 82% view it positively. Among Gen Xers and Boomers more than seven-in-ten say this has been a change for the better. Among Silents, 62% say the same. Views about the changing American family are more sharply divided by generation. In 1960, nearly half of all U.S. households consisted of a married mother and father living with one or more of their own children. By 2008, that share had fallen to roughly one-in-four households. Over this period, falling marriage rates, increasing divorce rates, the growth in cohabitation and the dramatic increase in single parenthood, gave rise to a variety of new family arrangements, according to a report last year by Pew Social & Demographic Trends. Millennials have a mostly positive view of this overall trend. Nearly half (47%) say the growing variety of family and living arrangements has been a change for the better. Only 16% view this as a change for the worse, and one third (32%) say it has not made much difference. On balance, Gen Xers also see this as a change for the better, however they are less positive than Millennials: 34% say this has been a change for the better, 24% see it as a change for the worse and 34% say it has not made much difference. Boomers are conflicted about the changes in family structure: 27% say this has been a change for the better, 33% a change for the worse and 31% say it has not made much difference. Silents are much more negative. Only 16% say the growing variety of family types has been a change for the better, while 30% say it has been been a change for the . Over the past 50 years, the link between marriage and parenthood also has become much more tenuous. The share of babies born to unmarried mothers increased eight-fold from 1960 to 2008. By 2008 four-in-ten babies born in the U.S. were born to an unwed mother. The public tends to react negatively to this trend. Very few adults, regardless of their generation, say this represents a change for the better. However, even on this issue there are sharp generational differences. 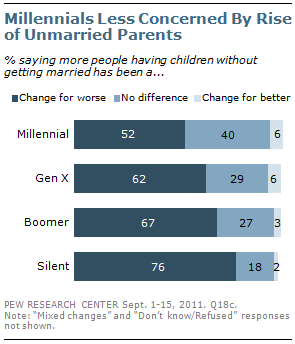 Silents overwhelmingly view the trend toward more unmarried parents negatively (76% change for the worse). Two-thirds (67%) of Boomers and 62% of Gen Xers also say more people having children without being married has been a change for the worse. Fewer Millennials (52%) agree; 40% of Millennials say this change has not made much difference. Previous surveys by the Pew Research Center’s Social & Demographic Trends project show similar generational splits on other trends relating to family and living arrangements. In a 2010 survey, a majority of Silents (62%) said the trend toward more unmarried couples living together was a bad thing for society. Only 27% of Millennials said the same. Similarly, while 58% of Silents said more gay and lesbian couples raising children was bad for society, only 28% of Millennials agreed. On both of these measures pluralities of Millennials said the trend didn’t make much difference. Technological change is another dimension of American life that divides the generations. Millennials grew up with the internet, and they overwhelmingly view its emergence as a change for the better (79%). Strong majorities of Gen Xers (70%) and Boomers (65%) also say they invention of the internet has been a change for the better. 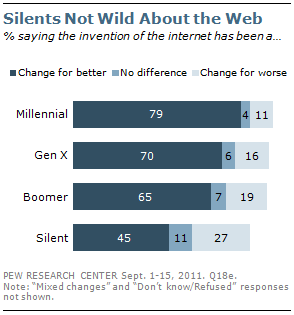 Silents are less persuaded: 45% say the internet has been a change for the better, 27% say it has been a change for the worse, and 11% say it hasn’t made much difference. Pew Research surveys have consistently found that Millennials outpace older generations in virtually all types of technology use – including the use of social networking cites, cell phone use, texting, and wireless internet use. And Millennials are much more likely than their older counterparts to believe that technology simplifies life rather than making it more complicated. In the Pew Research Center’s 2010 report on Millennials, 74% of this generation said new technologies such as cell phones and the internet make life easier; only 18% said these technologies make life more complicated. Silents are had a much more skeptical view: only 50% said technology makes life easier, while more than one-third (36%) said it makes life more complicated. The vast majority of American adults – nine-in-ten or more across generations – believe that moral values in this country have changed in the past 50 years. However, the generations differ over whether this has been a change for the better or a change for the worse. 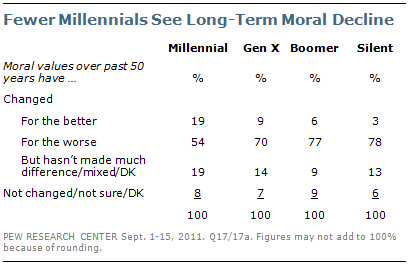 Among Millennials, only 54% say the change in moral values has been for the worse. This compares with 70% of Gen Xers, 77% Boomers and 78% of Silents. Millennials are twice as likely as Xers to say the change in moral values has been for the better (19% vs. 9%), and they are more than three times as likely as Boomers and Silents to view this change positively.